The dark horse candidate’s meteoric state-to-state rise continues in New Hampshire, which has never looked to be a particular source of his strength. The new poll from the Harvard and St. Anselm New Hampshire Institutes of Politics, taken between 10/2 and 10/6, puts Cain at 20 percent, only 18 points behind Mitt Romney. 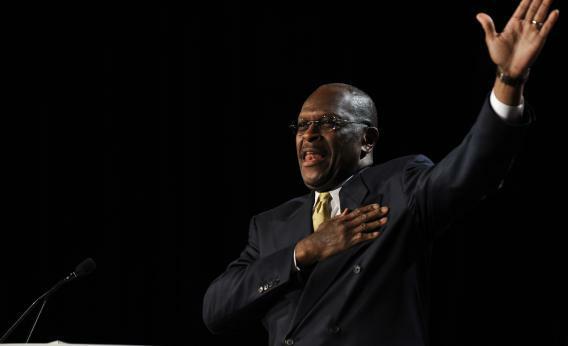 The internals reveal that Cain is the favored candidate of Tea Partiers (no surprise), but they appear to leave something out. Five candidates (and two non-candidates) have “name identification ratings and net favorability ratings,” revealing how many voters know them, and whether or not they like them. Cain doesn’t have those ratings? The reason: The pollsters did not anticipate his surge. That’s how fast Cain gained ground.